I’ve often wondered… What are the benefits of drinking lemon water? More importantly, does drinking lemon water first thing in the morning have any health related benefits or weight loss benefits? When I came across this article, I thought you might enjoy it as well. I found the answer quite interesting. Enjoy! For years, celebrities, wellness bloggers, and health coaches have touted the benefits of lemon water. They claim it kickstarts your metabolism and triggers weight loss — especially if you sip a warm glass of it first thing in the morning. But do the claims hold water? Does a simple glass of water with a little squeezed citrus actually possess magic slimming properties? Or is it just a different way to enjoy regular old water? In the study Gorin mentioned, 84 obese adults were asked to either drink two cups of plain water before their main meals every day for three months, or to imagine the feeling of being full. Those who drank water before their meals lost about 2.6 poundsmore than those who didn’t. This suggests that drinking water (lemon-flavored or not) before a meal may be an easy way to feel fuller and possibly prevent you from eating more than you should. Lemon water is also a far better choice than many other beverages out there. And, if used to replace sugary coffee concoctions, sodas, and energy drinks in your diet, lemon water can indirectly help you cut calories and shed pounds. To keep things ahem, moving, and your body operating at its best, your goal should be to drink half your body weight (in pounds) in ounces of water each day. If you start your day with a glass of lemon water, that’s one glass down! You’ll also get a small dose of vitamin C first thing. Downing a glass of lemon water right after you wake up is ideal — it rehydrates you after sleep, and may help assist your body in its natural process of flushing toxins. Also, proper hydration is necessary for good digestion. It’s a great way to feel more alert in the groggy morning hours. The only downside? Due to its high acidity, lemon juice may damage the enamel on your teeth. Of course, you’re not drinking pure lemon juice when you sip lemon water, but the concentration of lemon in your water can be higher if you keep the sliced lemon submerged in the water rather than just squeezing the juice into your cup. To offset possible damage to your tooth enamel, follow these simple precautions: Drink your lemon water with a straw so it doesn’t come into direct contact with your teeth (coffee lovers, take note! ), rinse your mouth afterward with a gulp of plain water, and wait for at least 30 minutes after you finish drinking to brush your teeth since harsh toothpastes and vigorous brushing can wear away at already thin enamel. There’s no wrong way to make lemon water. You can add a slice of lemon or a the juice of several squirts of half of a lemon. You can strain the seeds or ignore them — the choice is yours. 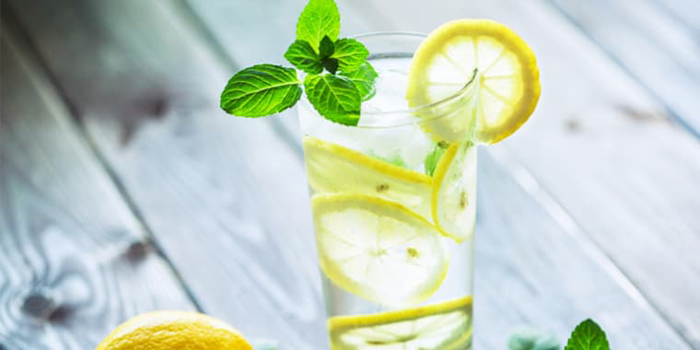 But for those who appreciate clear instructions, here’s a basic recipe you can modify as you like: Squeeze a quarter wedge of fresh raw lemon into 8 to 12 ounces of lukewarm or room-temperature water (for easy sipping), stir, and voilà! Your lemony beverage awaits. Feel free to dilute your lemon juice with more water if it’s too sour, or add the juice of half a lemon if you like it extra tart. PreviousGet ALL of the Beachbody Workouts for the cost of one SINGLE fitness program.